RIPON, Wis. — For years, it was a badge of honor among firefighters. Soot-stained bunker gear was a testament to the battles fought alongside their brothers. As a newcomer to the industry 29 years ago, I noted that the guys with the more soiled gear were the veterans to follow and listen to. Times have changed. Today, we know the dangers that lurk in that gear. For proof, we need only look at the staggering numbers. According to the International Association of Fire Fighters, 60% of career firefighters will die of cancer. Ours is a dangerous profession, and that danger lives on in our soot-covered gear well after the flames are extinguished. Laundry equipment is now one of firefighters’ greatest tools in protecting their lives from harmful carcinogens. Over the last five years, the fire industry has ramped up its focus on firefighter safety. It’s not enough to provide staff with the highest-quality protective gear, manufactured with cutting-edge fabrics and technical fibers. Today, we know that gear has to be cleaned in the proper way to not only maintain the integrity of those protective fibers, but also remove the dangerous carcinogens. Soils that end up in and on bunker gear can inhibit the performance of the flame-retardant qualities of the fibers or even be flammable. While many states are considering moves to mandate that departments install a washer in each firehouse, the National Fire Protection Association (NFPA) has not pushed for such standards to be applied. 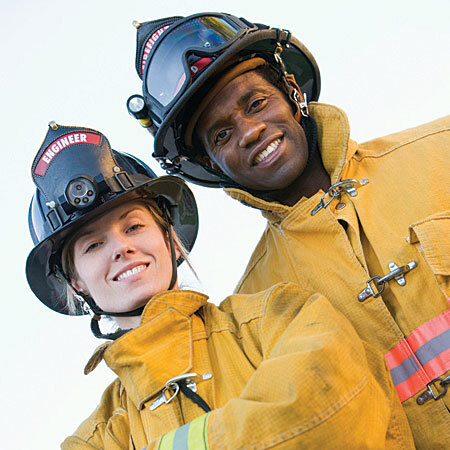 At present, NFPA 1851 is the accepted standard that addresses personal protective equipment (PPE) considerations, as well as the guidelines for maintenance of turnout gear. The most recent revisions to the standard were made in 2014. NFPA 1851 sets forth some basic standards, with the first being that departments have to adopt a plan for maintaining PPE, as well as a detailed record-keeping system that tracks the gear from in-service to disposal, with all cleaning, repairs and inspections in between documented. The cleaning process recommends firefighters stay responsible for cleaning their individual gear. It also prescribes that layers be separated. Debris that is dried onto gear should be removed and soft brushes used for lightly scrubbing top layers. Generally, water temperatures should be kept below 105 F, never use bleach, and the use of high-speed extraction cycles in washers is to be avoided. Where I have seen departments make mistakes is by selecting small, home-style, front-load washer-extractors. This presents a couple problems, not the least of which is capacity. Often these wash cylinders are not large enough to deliver an adequate drop in the wash process. Without it, wash quality suffers and gear is not returned to service truly clean. In addition, a lack of programmability handicaps departments, again reducing wash quality. Programmable controls help departments tailor wash cycles and extract speeds to the specific recommendations of the gear manufacturers. Lastly, most home-style, front-load washers produce too-high spin speeds, which can be damaging to moisture barriers of turnout gear. Commercial laundry equipment not only delivers the capacity that departments like mine and others need to return gear to service faster, but also the ability to fine-tune each element of the wash and spin cycles to ensure PPEs get the best care possible. This tailored approach is important from a safety standpoint, but at $2,000 or higher for a set of gear, getting a long, useful life from bunker gear is just as important. All departments, large or small, are in the same position in needing to craft a plan—either providing equipment in-house or sending it out to be cleaned. If I’m reading the future, I think eventually most departments will want to have laundry equipment on-site for having equipment cleaned and back in service quickly, and still rely on commercial ISPs for full cleanings, inspections and repairs. The first step to setting up an in-house laundry is to position your laundry expenditure with government or department budget staff as a health and safety matter, because it truly is. It’s not an equipment purchase. The next step is to look at equipment sizing to ensure you have the correct capacity. This is where the laundry equipment distributor will be able to assist. A good rule of thumb is 1 cubic foot of cylinder volume is roughly equal to one piece of gear. Gear should be separated between outer shell and inner liner (e.g., a jacket is two pieces, pants are two pieces, etc.). So, a 65-pound washer-extractor with 9.7 cubic feet of cylinder volume could accommodate roughly 10 pieces of PPE. As you begin to put together a plan for your laundry, obviously, it’s important to become familiar with NFPA 1851 standards and to make sure members of the house understand them as well. Lastly, connect with organizations such as Fire Industry Education Resource Organization (FIERO). FIERO can be an excellent resource in helping gain a better understanding of firefighter safety. I think eventually most departments will begin issuing two sets of gear to ensure a clean set is always ready to go when a call comes in. For busy departments in major metro areas, gear cannot be cleaned and returned to service quick enough. Two sets are required. This is no small investment, with upwards of 30 to 45 firefighters per house in some large departments. However, with an in-house laundry, departments likely will see the ability to produce a quality cleaning process and quickly return gear to service. Now that we know the risks associated with the harmful substances in our gear, cleaning guidelines and protocols will continue to shape processes in the house. Already, gear is no longer stored ready in living quarters. I think this will continue to work backward to just how gear is handled immediately after a structure fire. PPE is soiled at the scene, though it is not cleaned until back at the house. Thus, contaminants are brought into the rig, likely transferring to seats and other surfaces. I believe we’ll see more on-scene cleaning, similar to a hazmat decontamination, with gear then being bagged or isolated for transport back to the house for a more thorough cleaning. Years ago, firefighters breathed a sigh of relief each time they returned to the house safely after battling a structure fire. Today, we know that the danger doesn’t end when we leave the scene; it lives on in our gear. The very equipment we rely on each day to protect us can actually threaten our health more than the flames. But changes have come and will continue to advance. There is still educating to be done as the next generation of firefighters enter our industry. We must ensure they are trained as well on proper cleaning guidelines for PPE as they are on firefighting skills and tactics. I have no doubt that laundry equipment and chemical companies will become important partners to the firefighting industry. We will work together to develop processes that ensure PPE is properly cleaned to provide maximum protection to these brave men and women.